I was curious and did a quick search. The median malpractice claim payment for an adult anesthesiologist was $90,000 in 1993, and $111,000 for a pediatric anesthesiologist. Corrected for inflation, that's almost $200,000 today. But, isn't this instance more of a shift in cost rather than a reduction? It just seems like so much of this is a shell game. That is correct. The more specialized the higher the cost of malpractice insurance. My brother in law is a CRNA and he told me the anesthesiologists he works for ALWAYS is complaining about the high cost of his premiums. Also, the cost of premiums can vary significantly from state to state. Louisiana is crooked, and always has been so it wouldn't surprise me if surgeons in the state weren't paying some of the highest in the country. If a mistake is made, then restitution should be made. But, I've heard plenty of stories where the surgical staff is working on a very sick patient and he dies on the table. Without surgery the patient would have died. The doctors did their best, but they are not God. A lawsuit filed by the family comes in short order. At some point, admitting you're loved one treated his body like cesspool for 40 years is the honest thing to do. This shouldn't be a money grab. Would you rather the doctors not have tried? Because risk aversion on the part of the doctors is an understandable reaction at some point. Definitely. But the idea is that if (essentially) everyone were on Medicare, there would not be a built-in private insurer buffer to allow this cost shifting. If there were no uninsured patients, the contingency of medical bankruptcy would not need to be covered either. Overall U.S. healthcare expenditures would decrease. Medicare will not pay $900 for your neighbor's C-Pap accessories, and no one else of consequence would still be in the market, so medical device companies would not be able to overcharge them and offset this. They'd simply have to adapt to a lower revenue stream. Same deal with procedures, and hopefully prescription drugs. I know there is some legislation that shields gun manufacturers from being sued over their products. But it's open season on suing doctors? There ought to be a way to lessen the risk of frivolous suits against doctors while maintaining accountability for malpractice. That would, in turn, lessen malpractice insurance rates. Gotcha. Well, I hope a balance can be struck so that patients get timely, quality care and there's still the incentive for production of better drugs and medical equipment. I think there are mechanisms in place on the state level. I talk trash about Louisiana but they do have a cap on lawsuits. In 2016 I sat on a jury for a malpractice suit in which a guy had basically treated his body like utter crap for 30 years, had hyper tension for 15 years and wanted to sue two cardiologists, the hospital and anyone they could find for over $1.5 million. Each person on the jury had a binder of this guy's medical records for the majority of his adult life. The problem wasn't the cardiologists he was trying to sue, but rather the way he treated his body and ignored his health. When the roosters came home to roost, the doctors did the best they could with the situation they were dealing with. They saved the guy's life, basically gave him another 15 years to live. But there we were wasting taxpayers' dollars and everyone's time. That's always the goal. 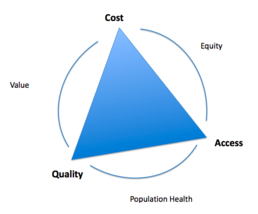 Public Health teaches the (increasingly controversial) concept of the Iron Triangle, which identifies the basic pillars of healthcare as quality, cost, and access. The idea is that changing to one or two of these pillars will affect the third. It's all about finding the proper balance. Bit of a tangent, but I'm all about the U.S. leading the world in medical drug research and device development. We cured hepatitis C a few years ago. I know a few people who worked on the team that did it, and their work is amazing. But I don't think the promise of corporate drug research requires us to submit to the pricing whims of pharmaceutical companies while the rest of the world aggressively negotiates deals on the very same prescription drugs. Even though I think research is the key to the future, I cannot support a situation where America largely subsidizes global pharmaceutical R&D, yet is increasingly unable to afford the very drugs we help develop. It is - without question - the most logical solution. I have pushed back against universal healthcare for years simply because I've known far too many on medicare and under VA care that weren't allowed many of things I'm allowed under private insurance - but I certainly pay for that privilege. Ultimately, it's just a matter of time before single payer is the standard in the US - the sooner we move, the sooner we can work to refine it. My brother was cured of HepC due to this drug - the cost was to be something like $100k for the course of treatment (which was only a few months, iirc) while the same exact medication was sole for tens of dollars in India. Amazing, stunning breakthroughs like this need to remain funded, but there's no reason why the cost should be so outrageous here and so cheap elsewhere. The reason it is so expensive here and cheap elsewhere is basically the socialistic model. We are the richest country in the world. We pay more to subsidize those who can't. Shrug.